Light & Darkness Radio: Featured Today! "Stargazery, Like Tomorrow..."
Stargazery (FIN) - Stargazery was born late in the year 2005. The force that led to form this band was one single song which Pete wrote. He felt it wasn't suitable for either one of his bands, Burning Point or Ghost Machinery. The song was later named "How Many Miles". It was clear from the start that the band needed a strong, melodic voice as well as a charismatic frontman. No question about it, Jari Tiura (ex-MSG, Snakegod) was the perfect choice. Bassist Jukka Jokikokko was an easy pick as he was already Pete's bandmate in Burning Point. The drummer at the time was Jarkko Huhtela, Pete's friend and a member from their band way back when... The wizard with the keyboards, Marco Sneck, was found from the ranks of Poisonblack and Kalmah. 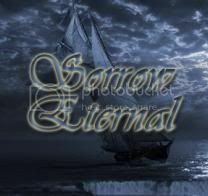 Early 2007 Stargazery made its first single "Dying / Rescue" which raised a lot of eyebrows and gained media attention with its melodic metal attack. The band did some selected live performances and decided it was time to start recording their debyt album. They entered the HelGate Studios (Oulu, Finland) to start the studio work. Unfortunately, the activities with MSG and Burning Point delayed the recording process. The drummer also decided to step aside from the band. However, Stargazery was determined to finish the making of their debut album. The bands line-up was completed again as Jussi Ontero (Burning Point, Ghost Machinery) sat behind the drums. Between 2009 and late 2010 the recording and the mixing of the album were done. After short negotiations Stargazery inked a world wide deal with Germany's Pure Steel Records. Like Tomorrow (FIN) - It all started seven years ago (2004) in Eura, Finland when three rebellious and good looking teenagers, all school buddies started to grow their hair because that is what the rockers do. Antti’s (guitar), Asko’s (drums) and Tuomas’s (keyboards) previous musical background was only based on self learning and solid interest in music. They had no singing skills (maybe later proven wrong), which was why their music was initially instrumental. However, the boys were lucky to find out that musical talent could also be found elsewhere in the world. After doing some serious thinking, Antti’s cousin Tuuli from Turku joined the band in autumn 2004 as the singer and figurehead. But yet they did not know what was to come. Samuli – another school mate, also good looking, yet unknown to Tuuli – was chosen to join the band’s only free seat without warning. Samuli became the bassist. This is how Like Tomorrow was born. After the New Year all the band members noticed that they were in the year of 2005 – and that was a good thing. Like Tomorrow’s musical genre began to stabilize in the melodic side of metal blended with nuances of ‘whatever feels good at the moment’. At the beginning of the year the band had already quite enough songs so it was time for their first studio visit. The first EP, Out of The Sight, with four songs was released in March the same year. As a result, the local media felt encouraged to contact the band. Like Tomorrow made their sound heard on the radio and their faces visible in the press. Even strangers called them with questionable intentions. And it was nice to get to play on a number of gigs. What could be better? (Well…) Dressing the Past was Like Tomorrow’s second self-paid EP which was released in November 2006. It felt good. They had finished their education but the compulsory military service was ahead of them. It bothered the boys – but not the barbers. The EP took the momentum in spite of everything and the masses got to hear their production because they won the YleX (one of the Finnish national radio stations) demo competition. In summer the boys finished their military service and, as a reward, the band headed on a low-cost trip to Bulgaria. During that time Dressing the Past had been successful enough so that they were given the chance to record their ‘hit single’ Author of Your Life in Petrax studio, Hollola. It felt like being an alcoholic in a tax free shop. They spend the rest of the year on making and polishing the songs for upcoming disc and doing some gigs. In July 2008 Like Tomorrow gathered again in the studio to record tracks for their third self-paid EP. A three-song EP Human Natural Selections was released in November 2008. The EP lifted the band up like an elevator and the band was satisfied. Human Natural Selections pleased both the band and all the other listeners. The disc was taken out of the hands like Justin Bieber in a teenage party. Imperiumi.net rated the record with top points. Desibeli.net imitated the review of Imperiumi. The band thought that ’the tribe had spoken’. But that was not the case: Soundi magazine (one of the biggest music magazines in Finland) chose Like Tomorrow’s third EP as the demo of the month. These reviews brought radio minutes, newspaper interviews, a TV interview and plenty of gigs in western Finland. The number of gigs had increased over the years but after Human Natural Selections the number of gigs soared. A logical continuum of all this was the bands first music video shooting of the opening track, Amber. The music video was released in spring 2009. After that the boys relaxed and headed to Rhodes, Greece. In the year of 2010 the band lived exciting times once again. The recordings of the fourth EP had been wrapped up and a new music video had been filmed. Containing two new songs, an acoustic live song and a music video, Perfect World was released in December 2010. The second music video was made from the energetic opening song Crossfade. Other highlights of the year were being a warm-up band for Stratovarius and success in Turku Bandstand competition where the band got to smile with bronze medals between their teeth. By the way, big smiles seem to be the band’s sovereign trump card. The band also visited California to check out surfers and girls roller skating in their bikinis. They might also have seen some kind of a big gap of rocks there. Now it is time to head for the annual trip to Lapland and see if the skis slide also outside band activities. With these words the year 2011 will be super and full of blast for Like Tomorrow. Mehida (FIN) - Out from the finnish music field rises MEHIDA. After several years of struggling with his musical vision, the keyboard player Mikko Harkin (Sonata Arctica, Kotipelto) decided to leave his previous band Wingdom to finally accomplish the sight and sound he had been looking after for many years. Musically the band is concentrated on bringing out the musical extremities, from difficult rhythmic sequences to unexpected modern melodic lines still keeping it all catchy and easy to listen to. The album "Blood & Water" is a reflection of creativism which flows out from the contribution of these talented rockers. The band's stylistic scale is wide. It flows from the mathematical metal attitude prog to deep dark beautiful ballads. Raging guitars and the strong expression of the singer Thomas Vikström (ex- Candlemass) form the missing link in between the ambient synth atmospheres and precise rhytmic sects. The album "Blood & Water" was recorded and mixed at the famous Fantom Studio, co-produced and mixed by Samu Oittinen (DIABLO, SILENTIUM etc.) On the album MEHIDA presents over fifty minutes of energetic modern metal. The enthusiasm towards music combined with unique creativity makes MEHIDA a rocksolid band. MEHIDA is a melodic metal band with a crushing sound. Musically the band is concentrated to bring out the elements of musical extremity, performing them with precise and soulful touch. Random Eyes (FIN) - The Random Eyes saga began in 1999 when guitarist and songwriter Timo Kuusjärvi met vocalist Christian Palin while both were serving in the Finnish army and the two became fast friends through their mutual musical interests. It would be a few years later in 2002 that Kuusjärvi and Palin would come across eachother again and began forging towards a common musical goal. Over the course of early 2002 Christian met co-vocalist Katja Rimpeläinen after running across the young lady while she was performing on a specific occasion. Captivated by the talent behind the graceful voice, Christian presented the idea to Katja of singing alongside himself in a duet-lead metal band. Acquiring the additional talents of second guitarist Mikko Tuliniemi along with drummer Timo Peltokangas and bassist Jukka Koponen, the band took on the name Random Eyes and entered themselves in a nationwide band contest which was held in Mäntsälä, Finland in the spring of 2002. Random Eyes claimed the gold at the event, coming across as the most complete unit with the advent of only three songs. Convincing both the public and the judges, Random Eyes quickly became a hot topic through word of mouth and media coverage of the event. After their victory however, it would prove that bassist Koponen felt that Random Eyes just wasn´t his calling, leaving the band in the process. New bassist Timo Mäki-Marttunen filled the gap in quick order and a third guitarist came into the Ramdom Eyes line-up in the form of Samuel Hoisko, who was a fantastic lead player. 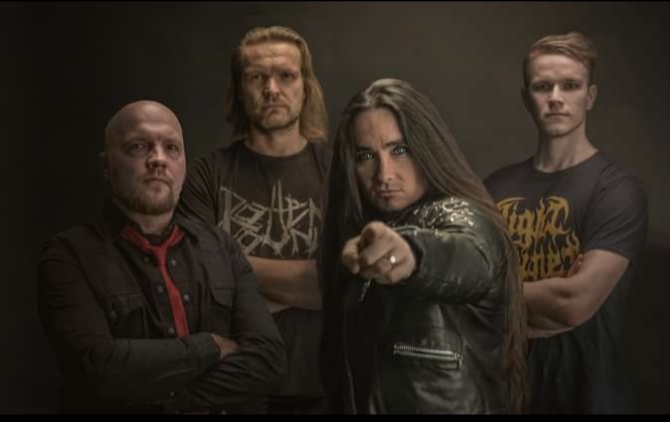 Random Eyes continued to gig around Finland, adding to their fanbase and making a name for themselves among the melodic metal fans around the country. The band compiled a set of songs and headed to the studio in the autumn of 2002. Along with producer Arttu Sarvanne of the acclaimed Studio Watercastle in Jyväskylä, Finland, Random Eyes recorded their debut album "Eyes Ablaze", which was released in February 2003. Playing alongside Swedish neo-classical metallers Narnia in Keuruu, Finland, the album release gig was a massive success, witnessed by hundreds of fans. Random Eyes is music for the new generation, melodic metal for the masses! Finnish metallic rock has a new face, burning with Eyes Ablaze! Yeah lot of Finnish bands huh? Just the best ~ Enjoy!